Airport Express Rt. 4 will be running normal route service and will be available and accessible for Bridge Runners to travel from Downtown Charleston Meeting Street at bus stop # 461 to the Expo in North Charleston to pick up race packets. The bus stop at the Downtown Visitor Center has changed. The stop is no longer located in the Visitor Center bus shed. Passengers will now use the bus stop located on Meeting Street across from the Charleston Museum (Stop #461). On Thursday, April 4th and Friday April 5th due to Bridge Run traffic combined with the Volvo Car Open and Flowertown Festival visitors; expect possible delays due to anticipated high volumes of traffic. All buses including Express buses will be running on regular schedule but will be affected by the high volumes of traffic. Any extreme delays may affect the Bus Tracker and Text or Call for Next Bus functions. Please call customer service for route information if your route is severely delayed at 843-724-7420. On Saturday, April 6, 2019 all routes that travel into the downtown area will be affected by road closures, detours and high volumes of traffic, expect possible delays. DASH route 211 will not start until the race is completed. DASH 210 and 213 will run on a detour. Routes 4, 7, 10, 11, 20, 30, 31, 33, 40, and 41 will all have detours. Click CARTA 2019 Bridge Run Service Impacts to view all detours and stops that will be missed during the detours along with alternate stops to use until service returns to regular service after the streets are reopened. 40 has three vehicles dedicated to it. One bus will circulate only in the Mt. Pleasant area. Using Towne Center as a transfer point, passengers can transfer to the other two Rt. 40 buses that will travel back and forth to the Downtown area via I526 until the completion of the race. 41 will run only in Mt. Pleasant on a detour until the race is completed. It will also stop at Towne Center as a transfer point to the Rt. 40 that will be traveling downtown. Expect some delays on these routes until the bridge has reopened and service returns to normal. The functions should return to normal after routes get back on regular schedule when all streets are reopened at the conclusion of the race. Please click here to view detour information. All routes will operate on a Holiday (Sunday) schedule on MLK Day – Monday January 21, 2019. Express buses will not operate. On Saturday, January 12, 2019 multiple routes will be on detour due to road closures related to Marathons in the area. Impacted routes include: Routes 10, 11, 13, 20, 30, 31, 33, 102, 104, 210, 211, and 213. Please click the link below to view detour details. On Sunday, Jan. 6, CARTA will make modifications to Route 31 Folly Road and Express Rt. 4Airport Express to increase efficiency. In addition to the schedule modifications, boarding activities at Transit Mall downtown will be modified. Starting on 1/6/19 Transit Mall will become a “deboarding only” stop meaning passengers should only deboard the bus at Transit Mall. Passengers who attempt to board at Transit Mall will be required to pay two fares in order to continue their trip past Meeting and Mary, which is the official beginning and end of the line. 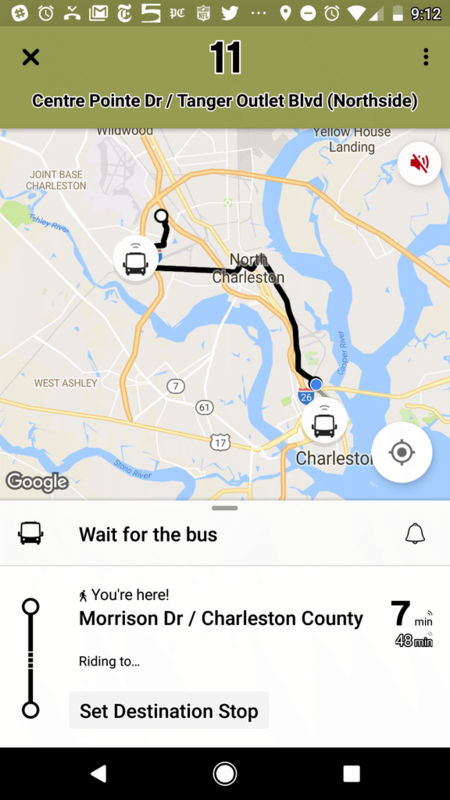 A summary of changes the routes schedules can be found at ridecarta.com/2019RouteChanges. Due to the threat of inclement weather from Hurricane Michael, along with King tides this week, expect possible delays and detours in service, especially in the downtown area starting on Wednesday 10/10/18. Any changes in service will be posted here, please check back periodically for updates. Guide includes tips to prepare for a storm and what to expect with CARTA service as a hurricane approaches. On Sunday September 9, 2018 several routes will have minor modifications to improve the efficiency and on time performance. Please click on the individual schedules below for details on all modifications. Slight schedule changes to improve efficiency. Route will no longer serve the shelter on Mt. Pleasant St. on the first southbound trip. Please board on the King St. side of Joseph Floyd Manor. CARTA encourages those with mobility devices to board on King St. as a safety precaution.